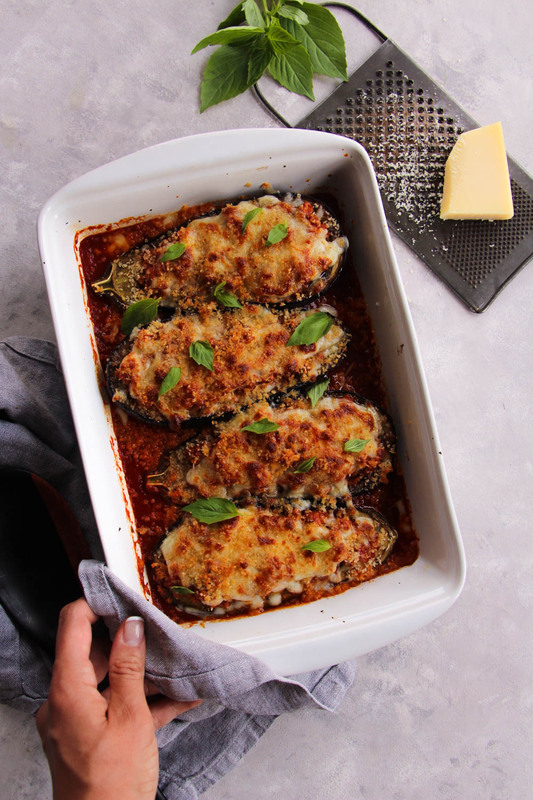 These Easy Low Carb Bolognese Stuffed Eggplant Parmesans are soooo tasty. 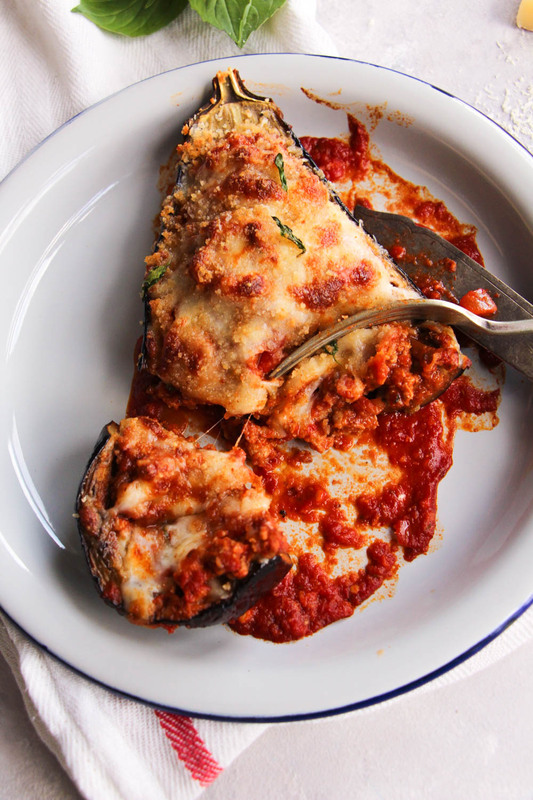 I love eggplant parmesan and bolognese and combining the two is the perfect meal for me. 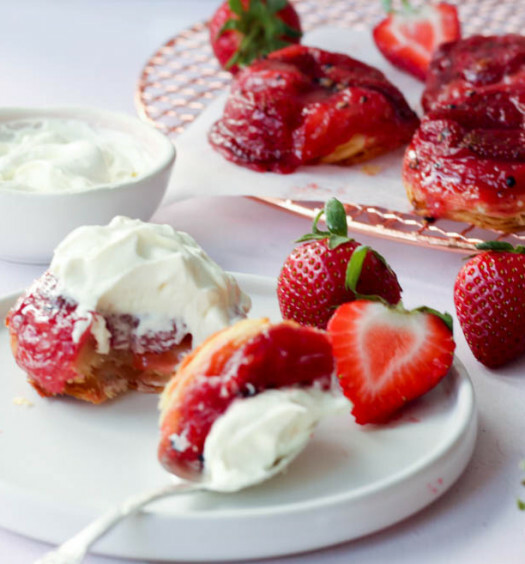 I make four (all for me…) and it’s basically my dinner meal prep for the week, sorted! 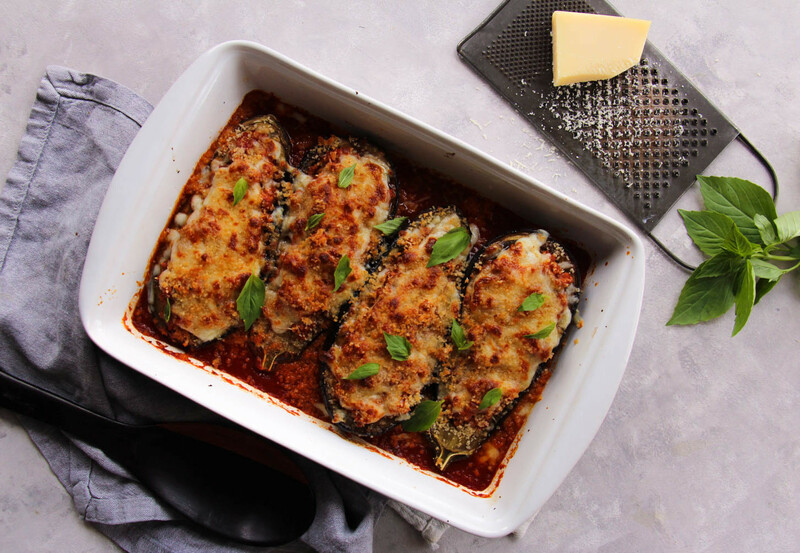 The sauce can also be made in advance as can the roasting of the eggplant, then just put it all together when ready to heat and serve. 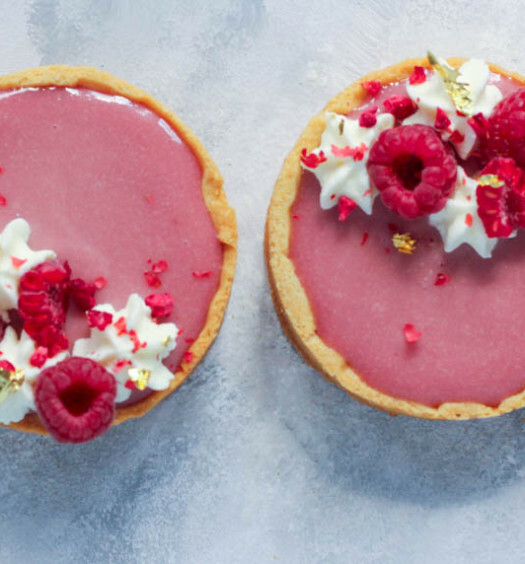 So i’m trying this thing where I share a few more recipes than I recently have been. Sorry i’ve been quite M.I.A with sharing any recipes. Living in the UK has been a whirlwind. In the best way possible. As of late, i’ve been eating quite indulgently. At work there’s quite a bit to taste and nibble on so i’ve been this little chipmunk with snacks. But i’ve stopped. Hard and cold. I’ve gone a little lighter on what’s going into my body nowadays. Low carb, no processed junk, no delicious british crisps, no delicious british chocolate, no refined sugars and definitely no bread/pasta/etc until further notice. I’m giving myself one day a week or so where i can cheat a little but i get right back on it. Honestly, it feels GOOD so far. 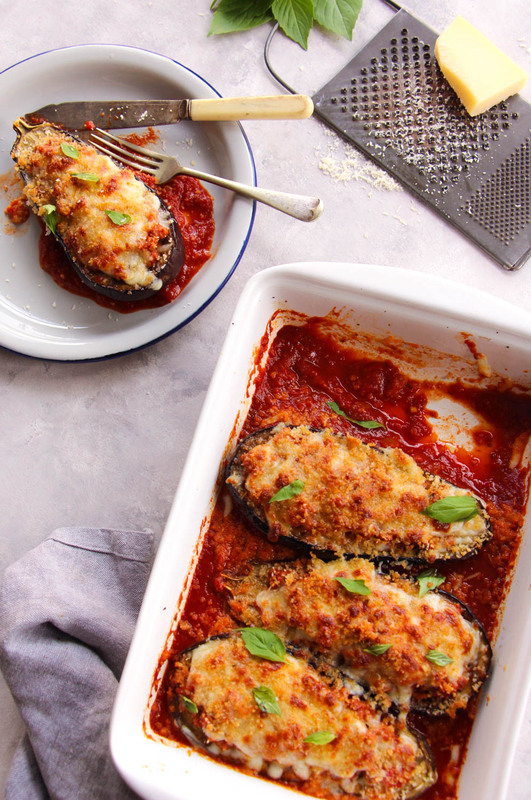 Many of you requested this recipe when I posted these Bolognese Stuffed Eggplant Parmesans on Instagram, so I hope you’ll make them! I’m loving that they’re perfect for meal prep, easy, baked, and truly delicious. Cut the eggplants in half. Using a small sharp knife, cut around the middle of the eggplant and scoop the insides out leaving a thick border. Dice the insides and set aside. Rub the eggplants with oil and season with salt and pepper. Arrange the shells in a baking dish cut side up. Roast until they’re fork tender, about 30 minutes. Set aside. Heat oil in a large pot over medium heat. Remove the sausage meat from the casing and break apart into the pan. Let it sear and break apart with a spoon. Cook through and remove. Add additional oil if needed. Saute the onion and fennel seeds in the same pan until the onions are softened. Add the garlic and chopped eggplant. Season with salt and pepper. Cook, stirring frequently until the eggplant is tender. Add the sausage back to the pan and stir to combine. Add the tomato paste and stir through to coat. Cook for 2 minutes. Mix the passata with the chili flakes, oregano, sugar and season with salt and pepper. Add two cups of this to the sausage mix. Cover and let simmer for 15-20 minutes. Mix together the bread crumbs, 1 tsp oil and a pinch of oregano. 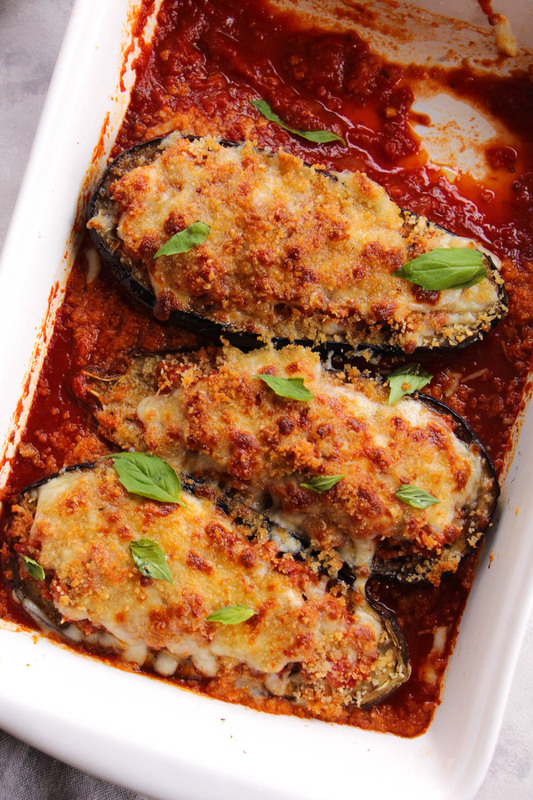 Remove eggplants from the dish, pour in remaining passata and spread evenly on the bottom. Arrange eggplants back in. Fill each generously with the bolognese. Top with grated mozzarella and parmesan, followed by breadcrumbs. Return to oven and bake for 10 minutes until the cheese is melted and bubbling. Remove and sprinkle with fresh basil. To make these vegetarian, you can replace the sausage meat with chopped mushrooms, lentils or even more vegetables like diced courgettte, peppers etc.